For the past few years, rice cookers have been flying off the shelves and most of us have learned the basics about rice and how to introduce it into our diets. Usually, when purchasing their first rice cooker the tend to reach for the least expensive one just to see if you like the results. Cooking rice on the stove top can be a daunting task as you need to stay by the stove and keep watch so the rice doesn’t boil over or get dried out from too much heat. After owning your cheap rice cooker for a while, you now know that you do want rice in your diet forever and you are ready to purchase a unit that will give you perfect rice every time. You will want a rice cooker that will be easy to use, easy to clean, attractive, lasts a long time, and cuts down on the time you spend in the kitchen. 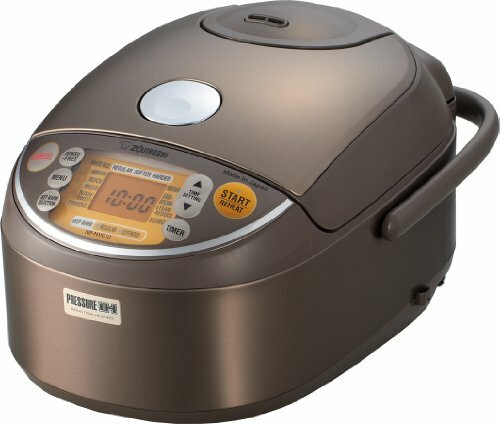 Since this will be the last time you purchase a rice cooker, I have reviewed two of the best units for you and would like to pass that knowledge on to you. I personally don’t know what I would do if I had to cook rice the old fashion way again. A rice cooker is a must in the modern-day kitchens. First, we will look at the Cuckoo Pressure Rice Cooker CRP-FHVR1008L . This cooker is made in Korea where rice is a mainstay in their diet and has been for centuries. This unit will expertly detect what kind of rice you put in it with its “Fuzzy Logic” or as the company calls it, an intelligent Cooking Algorithm. When we talk about induction heating, very simply, it means the heat is generated within the unit, itself instead of by an external heat source via heat conduction. The objects can be heated very rapidly and in the rice cooker, the inner pot is the heat source. Thus, your Cuckoo Rice Cooker can do its job in no time at all with no guesswork. This would be a Time-Saving Convenient feature. 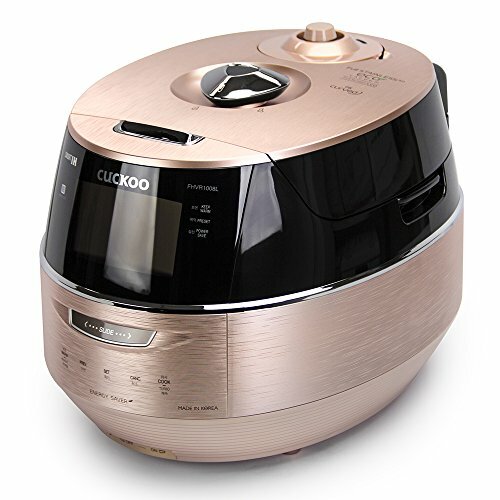 If you are looking for a more indepth review on the Cuckoo Rice Cooker check it out here. 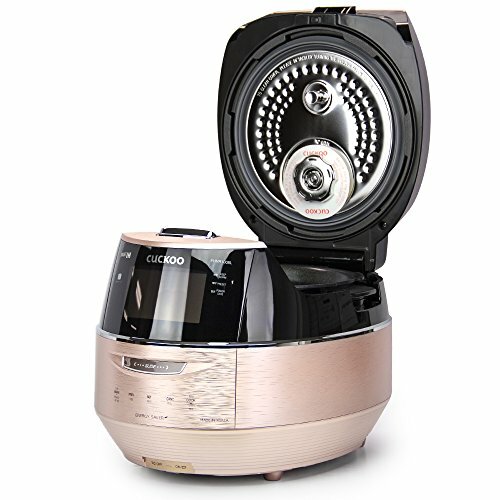 The inner pot has a full stainless Eco 2.0 interior and is designed for durability. You should never have to replace it as it is a professional quality pot with a non-stick coating. The interior of the lid can be removed for easy cleaning as can the inner pot. This will service 1 to 3 people nicely as it uses 3 cups of uncooked rice for a 1.8 liter of cooked rice. As far as safety is concerned, the Coukoo Rice Cooker is equipped with automatic steam and pressure emissions, automatic temperature control, warming feature, and a neat alarm to warn you if it is overheating. The lid locking device is tight and trustworthy for pressure cooking. Most customer were happy with this rice cooker even though the price is higher. It probably shouldn’t be your first rice cooker purchase, try a cheaper model until you really know what you want for end results. This unit is a complicated for first time users, but the quality surpasses its competitors by miles. The Zojirushi Induction Heating Pressure Rice Cooker NP-NVC18 is a one of the most intelligent rice cookers on the market. It operates with AI (artificial intelligence) as does the Cuckoo rice cooker. It cooks 10 cups of uncooked rice and keeps it warm for you. This will service one person or a small family at each cooking. The inner pot is infused with particles of platinum which alkalizes water and in turn, breaks down the surface of the rice grain making it more water soluble and easier to cook plus brings out the sweetness in the rice. The platinum pot is also nonstick due to this coating. Safety concerns are addressed by a pressure control valve, an inner lid filter and a lock on the lid during pressure cooking. The power cord is retractable so it will not be in the way while on the counter top. This cooker automatically chooses from three different pressure settings for perfect rice every time. The face has multiple computer settings, and an easy to read LCD control panel with multi-menu cooking functions. It also includes a clock and delay timer. The Owners’ Manual is an easy read. The unit also comes with a rice spatula, a holder for the spatula and two measuring cups. The weight is 13 pounds and the design is more elongated than other cooker that stand taller on the counter. 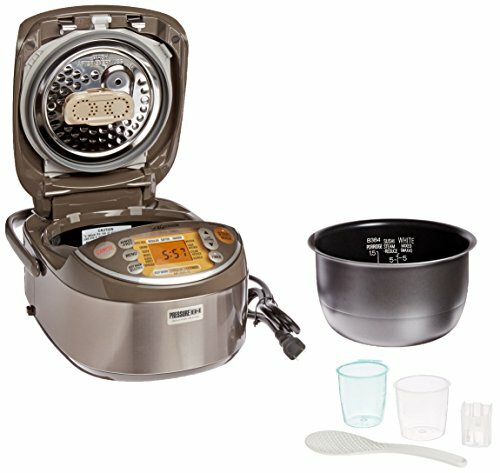 If you are looking for a more indepth review on the Zojirushi Induction Rice Cooker find that here. While comparing the Cuckoo vs Zojirushi, we find that both rice cookers use induction heat, pressure cook method, and both produce quality prepared rice every time. They are pretty much compatible in price. As far as functionality is concerned, they both use AI or fuzzy logic which gives you numerous settings for different grains of rice. The fact that the coukoo has voice navigation in English, Chinese and Korean is a plus. The Cuckoo has a stainless-steel inner pot and we all know the beauty of stainless steel. The Zojirushi cooks 5.5 cups of uncooked rice while the Cuckoo cooks 3 cups. Good luck with your findings and I hope you get the rice cooker that is perfect for you and your family. If you are interested in purchasing a small rice cooker, click this link here, for more information.